Image by mensatic via morguefile.com. If you are interested in how scientists are currently viewing animal-based research, there is a free online course available, taught by employees of Johns Hopkins University (one of the big animal research “players”), Alan Goldberg and James Owiny. The course is called Enhancing Humane Science – Improving Animal Research. It is sponsored by the Center for Alternatives to Animal Testing, which sounds great until you realize it’s also part of Johns Hopkins. This course is absolutely not in any way unbiased. Johns Hopkins has a lot of big stakes in animal-based research. I’ll admit I haven’t listened to the whole course yet, but it reeks of the stuff I had to read while working in animal research. It appears to be a pretty accurate picture of the scientists’ point of view concerning animal welfare. I’m not defending or attacking anybody here. This mess, and my opinion of it, is too huge and complicated for me to summarize it in one journal post. But if you were looking for a good introduction to how scientists look at animal research, and where they are coming from when they say, “But we are doing everything we can for the animals in our care,” this is where a lot of them are standing right now. The jargon and the general attitudes are appropriate and seem pretty representative. They aren’t cackling and rubbing their hands together, drooling over the prospect of thousands of dead mice. On the other hand, these animals routinely undergo experiences we would not inflict on our pets. 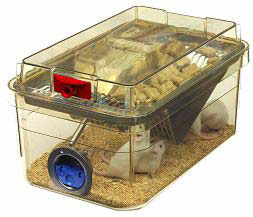 The image to the right is of a standard laboratory mouse cage. This is considered a pretty cutting edge mouse habitat these days. The unit is actually fairly airtight — the blue and red things are valves through which air enters and exits the chamber when the cage is inserted into a “ventilated rack system” (described below). These cages are designed to work with the rack system keep the environment the mice are in separate from the outside environment, usually by running any air going into or out of the cage through a replaceable HEPA filter in the top of the cage (not visible in the picture). 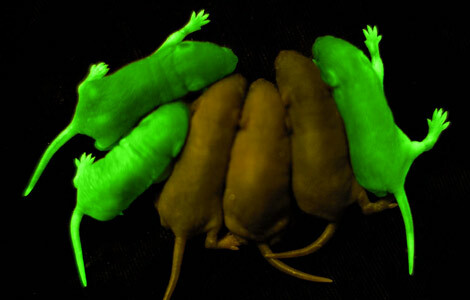 This keeps immunocompromised mice from getting sick, and keeps lab workers from catching anything the mice might have. Generally, facilities limit the number of adult mice in such a cage to five, which works out to fifteen square inches of space per mouse — the size of a three by five index card. In practice, these cages are often far more full even than this. For example, breeding colonies often keep two adult females with an adult male and, either through protocol or lack of finesse on the part of the researcher or technician, may allow the resultant litters to remain in the breeding cage until they are weaned at about 21 days. At left is an image of a 21-day-old mouse next to an adult. Average litter size for a laboratory mouse is between 6-8 pups (although as many as 20 can be born at one time). Imagine the cage just before weaning, with three (or more!) adults and potentially more than twenty “pups” that are fully half the size of the grown mice. I have picked up cages in which the bedding was not visible through the mass of mice inside. They do make larger cages which can be used for breeding, but these require more space, are more difficult to change and sterilize, and are more expensive to purchase, and are not always used. Here is a photo of a ventilated rack system made by Allentown, Inc., a primary rodent housing supplier. These racks are, again, the cutting edge for keeping a lot of mice in a very small space. Previously, mice were placed on shelves on rolling racks; in this technologically advanced age we have perfected a model for keeping mice in almost the absolute minimum space possible. 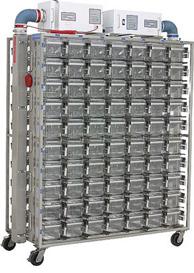 These racks hold 100-200 cages apiece, with a single “standard” size mouse room able to potentially hold three to twenty racks. I worked in a facility which had six 150-cage racks in a single room (one of many mouse rooms). One technician was assigned to oversee all 900 cages in this room. How diligent do you think that person could be when inspecting individual mice (remember, 1-5 mice per cage, potentially 4,500 mice in this room) for disease? The boxes on top of the rack are the intake and exhaust blowers, which force air through the system and keep the rack either positively (no outside germs get in) or negatively (no inside germs get out) pressurized. Although all cages receive equal amounts of fresh air (at 40-60 full air exchanges per minute, it must be like living in a wind tunnel), light is definitely in short supply down on those bottom racks. The techs I worked with used to carry flashlights to see the bottom rows. Note that there aren’t actually laws dictating minimum required living conditions for mice and rats. Rodents are not covered under USDA regulations (which is one reason they are so popular as laboratory animals). “Minimum living space” for mice and rats right now is “whatever we want it to be”. Currently, more or less voluntary standards for this are set by the laboratories themselves, under the guise of the National Research Council, which could be considered to be just a bit biased in favor of the scientists. There is a voluntary system of conforming to these standards via accreditation, but no federal agency is involved in enforcing them. In fact, here is a page wherein the federal government is currently busy trying to buy a rack with even smaller (61-square-inch) cages for its own use.